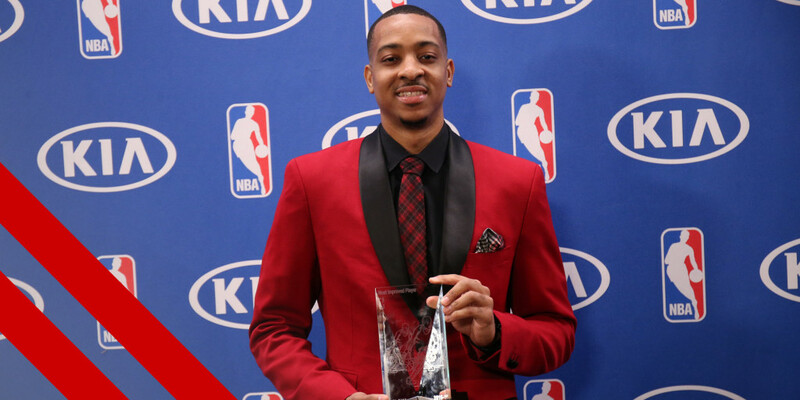 Picture: Reigning Most Improved Player CJ McCollum – who will take the trophy in 2016-17? It seems like there are a lot of guarantees heading into this season (I think we all have a pretty good idea who will be playing in June), but one thing that is never guaranteed is which players will step their games up and have a breakout year. One of the most exciting parts of every season is witnessing players burst onto the scene. Whether it be youngsters finding their stride, players entering their primes or veterans suddenly taking it to the next level, every year there is a different crop of hungry players who shake up the league. In recent years we’ve seen guys like Isaiah Thomas, C.J. McCollum, Jimmy Butler and Draymond Green do this. And while this can be one of the hardest things to predict going into a season, we thought we’d give it a try once again. Here are six players ready to break out in 2016-17. Schroder spent the first three years of his career in Atlanta as a backup to Jeff Teague. Now, with Teague having been shipped to Indiana in a three-team deal, the keys to the car have been handed to the enigmatic German playmaker. Although Schroder has primarily been a reserve in Atlanta, he has still been an important piece for the Hawks the past two seasons. Last year he was a sparkplug off the bench, averaging 11 points, 2.6 rebounds and 4.4 assists in just 20.3 minutes per night. With Teague out of town, Schroder is the starter and will play a bigger role, with more minutes and more responsibility. He seems ready for the challenge. Even before the moves this offseason, coach Mike Budenholzer and the rest of the Hawks staff displayed a lot of confidence in the 23-year-old. He was put in the game at key moments and played important minutes a number of times during the season. He played in some pressure moments in the Hawks’ Eastern Conference semi-final loss to the Cavs, including the entire fourth quarter of Game 4. Despite the fact he is still in his early twenties, Schroder will be the third longest tenured Hawk in 2017, behind only Mike Scott and Kyle Korver. With this in mind, leadership will be key for the young point guard. In the past, he’s been known for his erratic play and occasionally temperamental demeanour. He will need to reign that in to be successful. What shouldn’t be questioned is his production. Schroder does a lot in his time on the court. Last season he boasted per 36 minutes averages of 19.5 points, 4.5 rebounds, 7.8 assists and 1.6 steals. With increased minutes, Schroder’s impact should climb, helping his potential for a breakout year. It’s hard to imagine that a guy who is entering his fifth season, and who has already been a key contributor to a championship team, could be a breakout candidate. But in Barnes’ case, this is more than fitting. While he has been solid throughout his career, the former UNC stud looks like he has a lot more to offer. He spent the first four years of his career playing on a loaded Golden State Warriors team. Though playing alongside the likes of Steph Curry and Klay Thompson sure has its benefits, it doesn’t leave much room for guys like Barnes to showcase everything they’ve got. Throughout his tenure in the Bay Area, Barnes was a fourth option at best, and most of his shots came from space created by his aforementioned All-NBA teammates. After a disappointing Finals performance and the team’s signing of Kevin Durant, Barnes signed a whopping four-year, $94 million contract with the Mavericks. Despite his no-show performance in June, the Mavs have high hopes for the 24-year-old. It seems realistic that a lot will be asked of Barnes in 2016-17. Dirk Nowitzki, Deron Williams and Andrew Bogut are all past their primes. Add that to the fact that Dallas just lost one of its key wing men and primary playmakers in Chandler Parsons and there are a lot of responsibilities for Barnes to assume. He’ll also look to use his experience playing with Team USA in the Rio Olympics to initiate more growth going into the season. While he didn’t play many minutes, the experience could prove invaluable, just as we saw for James Harden and Anthony Davis. Both of those guys were on the end of the USA bench in London in 2012 but followed that up with big-time NBA seasons. Like Schroder, Capela has spent the first few years of his NBA career playing backup to a more formidable veteran. In Houston, Dwight Howard played the bulk of the minutes at centre, and as always, garnered the most attention. Now, with the Howard era in Houston coming to a rather Howard-esque end, the centre spot is wide open, and Capela seems primed to capitalise on this opportunity. While the Rockets did bring in veteran centre Nene, most analysts still have Capela projected as the Rockets’ starter going into ’16-17. Nene has been a force for years, but he just turned 34 and is well and truly on the decline. He is coming off his worst statistical season since entering the NBA in 2002. Last year he appeared in just 57 games, and started only 11. With this in mind, and coupled with the fact the Rockets will be playing in Mike D’Antoni’s run and gun system, it is more than likely Nene will be used as a versatile spot player off the bench, giving Capela most of the burn at the five. This bodes well for Houston. Last season the Rockets went 22-11 in games when Capela played 20-plus minutes, compared to just 19-30 in games when he played less than 20. The Swiss big man also put in work in his time on the court, boasting per 36 minutes averages of 13.3 points, 12.1 rebounds and 2.3 blocks. There is no doubt that defence and rebounding are Capela’s bread and butter. His size, lateral quickness and instincts and awareness allow him to excel on that end of the floor. A lot will be asked of the young centre this year, as Capela will be relied on to be the team’s defensive anchor as well as the primary roll man in D’Antoni’s spread offence. He’ll likely score most of his buckets rolling to the rim or from offensive rebounds from the abundance of threes the Rockets will shoot this season. Russell’s rookie season was tough, to say the least. He was playing on a terrible Lakers team for an old-school coach who doesn’t exactly lend himself to the needs of young players. He fell in and out of the starting lineup. The Lakers’ whole season was basically a sendoff party for Kobe Bryant, which somewhat stunted the development of Russell and the rest of the young guys on the roster. And, of course, there was that not-so-fancy situation Russell got himself into involving a mobile phone, Iggy Azalea and his teammate Nick Young. So maybe “tough” is an understatement. Even with all of these distractions, Russell still had some brilliant moments in year one, including a 39-point performance against the Nets in which he went 8-of-12 from downtown. He is seriously talented, which is why the Lakers drafted the former Ohio State Buckeye second overall, ahead of Jahlil Okafor and Kristaps Porzingis. Now, with the Kobe mania over, and a new head coach in Luke Walton, things are looking up for Russell. Russell showed everybody the strides he’s made in the Las Vegas Summer League. In four games he averaged 21.8 points, 6.3 rebounds, four assists and 1.5 steals on 47.7 percent shooting. He hit two massive shots down the stretch in a game against Philadelphia, including a game-winning three-point bomb at the buzzer. He also spent a week of his offseason as a member of the USA Select team, which trained and scrimmaged with the U.S. Olympic team in Las Vegas. Russell has all the tools and all the charisma to be a star. With more responsibility, more trust from his head coach and, most importantly, more opportunity, look for him to have a breakout year in ’16-17. Parker’s rookie season of 2014-15 was cut short after he tore his ACL just 25 games into his highly anticipated NBA career. However, he did recover in time for last season and played well. The Chicago native put up averages of 14.1 points and 5.2 boards while shooting nearly 50 percent from the field for the Bucks, and he did enough to make the USA Select team. While his output with Milwaukee in 2015-16 was solid, it was not spectacular, and he clearly has more to give. Last season was really the 6-foot-8 forward’s rookie year, his first full season of action. And, for a player who was once the most highly touted high school player in the country, it seems like things can only go up. All of the hype around Parker comes from his pre-NBA career. He played his high school ball in Chicago at Simeon Career Academy, the powerhouse that also produced the likes of Derrick Rose and late Chicago legend Benji Wilson. Parker led the school to four straight state championships and in his senior year won the national Morgan Wootten Player of the Year award. His high school dominance earned him a scholarship to Duke, where he turned in a stellar one-and-done freshman season for Mike Krzyzewski. He averaged 19.1 points, 8.7 rebounds, 1.2 assists and shot 47.3 percent from the field in 30.7 minutes of action, and he played in the extremely physical ACC. He received consensus first team All-America honours, was named the national freshman of the year and finished runner-up for the John Wooden Award for national college player of the year. Although his development since being drafted second overall by the Bucks in 2014 has been somewhat delayed, his ceiling is still extremely high. After being drafted 13th overall by the Suns in 2015, Booker had a far better rookie season than most people predicted. Due to injuries to Brandon Knight and Eric Bledsoe, Booker received extra playing time in 2016 and well and truly capitalised on it. His play earned him All-Rookie first team honours, and even a pair of signed sneakers from Mamba himself. In the 19-year-old’s two games for Phoenix in the Las Vegas Summer League this offseason, he put on a show with averages of 26 points, five rebounds and 6.5 assists while shooting 60 percent from long range in 33.5 minutes. And it’s that same maturity that will help the youngest player on this list take his game to the next level. It’s that maturity that makes a player coming off a stellar rookie year want to continue to work hard every day.